North West: Greater Manchester, Lancashire. Senior Commercial Underwriter sought to accurately and profitably underwrite products for SME clients, identifying the right clients, deciding terms and developing relationships with brokers/clients to develop/retain business. Utilising strong technical capability and acting as the referral point for the Underwriters, with an emphasis on coaching to increase technical and trading capability of the SME Underwriting team, to impact positively on the profitability of the account. Putting sustained effort into building influential relationships internally and externally, taking ownership and responding to broker demands. Building trading relationships with brokers, and supporting development of pipeline opportunities to maximise financial results. Demonstrating contribution to loss ratio control by effectively implementing branch underwriting controls. Monitoring the overall performance of the book and ensuring remedial action is taken to correct any performance issues. Contributing to the development of peers by coaching and acting as a reference point to assist in decision making and acting as senior referral point on technical queries for junior underwriters in the business. Strong level of technical underwriting expertise in a commercial insurance environment. Sound understanding of insurance market and processes across commercial lines insurance operations. Strong trading capability - commercial awareness, negotiation skills, and the ability to build strong broker relationships. Proven experience in decision making and excellent risk assessment and risk management skills. Excellent communication, interpersonal, coaching and development skills. Progression towards Dip CII qualification desirable or equivalent experience. Tel: 0161 839 4199 Mon to Fri 8.30am - 5.30pm. Would you like to receive information about similar jobs? Please complete all required fields and/or tick all boxes accordingly. 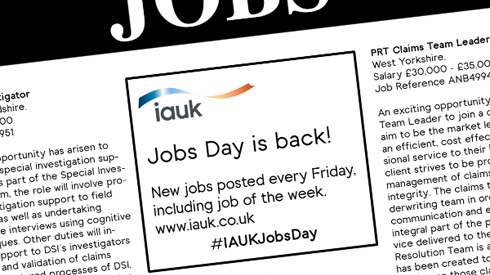 Sign up for free job alerts to keep updated with the latest jobs that match your criteria.